On Friday, October 8, Freedom Alliance teamed up with the Ward Burton Wildlife Foundation for an event to support injured service members and veterans. 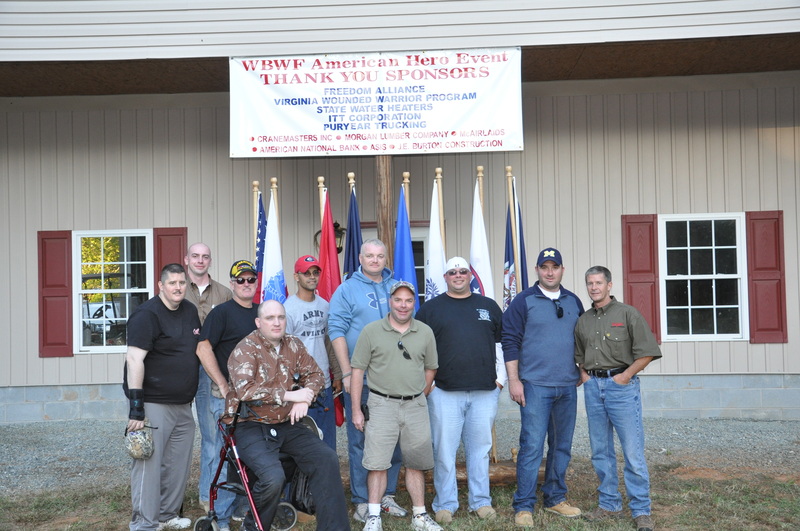 Thirty troops and veterans gathered on Burton’s wildlife reserve in Virginia to compete in a series of outdoor sporting activities including fishing, archery, and pistol shooting. “The outdoors is a place where those recovering can find relaxation and enjoy themselves, an important part of the healing process. It is also a place where veterans can participate in sporting events they may not have been able to do since they were active duty,” said Freedom Alliance President Tom Kilgannon. Professional sportsmen assisted in helping to sharpen the skills of each participant as they competed for trophies, prizes, and bragging rights. Bowtech, the leading manufacturer of compound bows, provided expert advice as each participant shot from 20, 25, and 30 feet. Soldiers from Range Operations at Fort Pickett, the National Guard Maneuver Training Center located in Blackstone, Virginia, assisted the participants in techniques to improve their pistol shooting. Among the troops participating were Wounded Warriors from the Fort Eustis Warrior Transition Unit (WTU) and veterans from Vietnam. A Light Infantry National Guardsman from Waynesboro, Virginia, said that he was very thankful for the opportunity to get away from the WTU to relax and participate in activities that were normal for him before his injuries. A soldier from Queens, New York, who is currently at the Eustis WTU, spoke about how hard life has become as a “Warrior in Transition.” While he understands the importance of being at the WTU in order to heal, the soldier wants nothing more than to return to his wife and eight children in New York. At the end of the day all participants and staff gathered for a barbeque dinner and outdoor live entertainment. Ward Burton gave a special thank you to all who have served in current operations as well as those in past conflicts. Burton says on his website that his true love has always been the outdoors, and that there’s no one better to share that with, than those who have served this country.